We’ll see some familiar faces in the 2010 Pro Bowl in Hawaii next year. No surprise that Drew Brees was selected as the starting QB for the NFC and Brett Favre and Aaron Rodgers will be his backups. This will be Favre’s 11th Pro Bowl appearance (not bad for a 40 year old!). 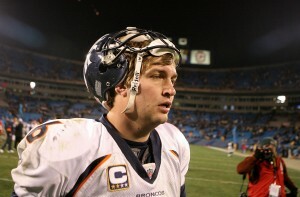 Peyton Manning will represent the AFC as the starter and Philip Rivers and Tom Brady will be the backups. 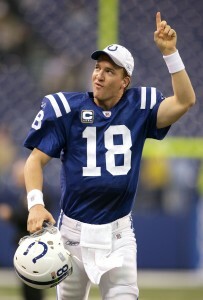 This will be Manning’s 10th appearance. Manning and Favre are the only QB’s that have made the Pro Bowl at least 10 times. Question is, will the Cincinnati Bengals give the New York Jets another gift like they got last weekend against the Colts (see post dated December 28th ). The Bengals have already clinched a playoff birth so they could easily go to New York and take it easy, giving their players a rest and making it easier for the Jets to secure their own playoff spot. 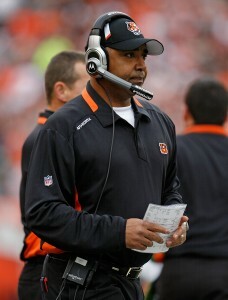 There of course could be arguments both ways but it would be tough for Bengals Coach Marvin Lewis to have his team play at half mast and lose momentum going into the playoffs. Tune in Sunday night to see what happens. The Monday night matchup between the Minnesota Vikings and Chicago Bears turned into an overtime showdown with the Bears’ QB Jay Cutler tossing the game winner to Devin Aromashodu for a final score of Chicago 36, Vikings 30. With Minnesota’s loss, the New Orleans Saints gained homefield advantage throughout the playoffs. Even though the Vikings are still in the playoffs, Brett Favre was very upset about the team’s third loss in four games. And then there were none. The Colts perfect season is over (which means the 1972 Dolphins still hold the record for the only team to have a perfect season throughout the Super Bowl). It was a very unsatisfying ending to their perfect run. 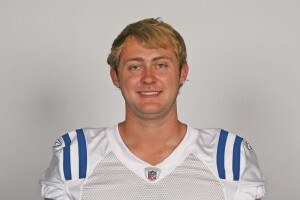 At the end of the third quarter, Colts coach, Jim Caldwell, decided to rest QB Peyton Manning and put in rookie Curtis Painter and well, as you would have expected, that was all the Jets needed to pull off a a 29-15 win. Of course it’s easy to criticize Caldwell for pulling Manning (as everyone will be doing this week) but if Manning did get hurt, then you can bet we’d all be questioning Caldwell’s decision to keep him in. So, basically it was a no win situation and a huge gift to the Jets who are still in the playoff hunt. Looks like the self-proclaimed “fight of the century” between Manny Pacquiao and Floyd Mayweather Jr.is not happening. Their promoters disagree over blood testing. Bob Arum, Pacquiao’s promoter, agreed to have the fighter give urine as part of the drug testing but Mayweather’s camp wants both fighters to give blood as they do in Olympic-style drug testing. 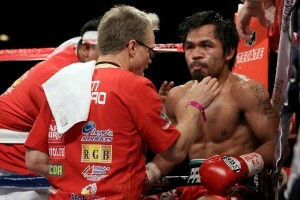 Pacquiao has said he has an issue with giving blood and that doing so right before a fight will weaken him. Apparently it’s less than a teaspoon of blood though, so not sure this is a really good argument. It’s hard to imagine them not working this out as the fighters could make between $30-$40 million (depending on tv sales). All eyes will be on the big Christmas showdown between the Los Angeles Lakers and the Cleveland Cavaliers, or to put it more precisely, the big showdown between Kobe Bryant (Lakers) and Shaquille O’Neal and LeBron James (Cavaliers). Expect a lot of “who’s better”, Kobe vs LeBron, this Christmas Day. Tune in Friday night 5:00 ET on ABC. Michael Vick certainly seems as if he is turning his life around. After 18 months in a federal prison for his role in dogfighting, Vick (former 3 time pro-bowler as a quarterback for the Atlanta Falcons) Vick’s new Philadelphia Eagles teammates awarded him the Ed Block courage award. The award symbolizes sportsmanship and courage. Even though PETA doesn’t believe he’s worthy of a second chance, Vick has been working hard toward re-building his reputation. He has spent time with the Humane Society of the United States as well as speaking to groups about his mistakes. 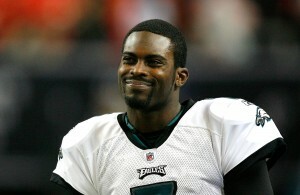 “It was a big obstacle proving I’m worthy of a second chance,” Vick said. The Giants kept their playoff hopes alive with their crushing win over the Washington Redskins Monday night. Eli Manning looked good with three touchdowns for a 45-12 win. The most exciting part of the game was the odd trick field goal at the end of the first half. The Redskins were losing 24-0 and they decided to play it crazy on a standard 38 yard field goal. Most of the team split out to the left side of the field. The Giants called a time out because they were confused (as were all of us). The Redskins lined up again for a regular field goal attempt then split out to the left. The snapper, Hunter Smith, took the ball and essentially threw a “hail mary” to everyone on the left side of the field. Well, big surprise, it was intercepted and everyone is wondering what Redskins’ head coach Jim Zorn was thinking. Attention all Miami Dolphin fans…it’s that time of year when you really start to sweat…yes, it’s that dance we do every few years when there is one team seriously threatening to take that 1972 exalted perfect season record from you. Going into last week’s games, two teams threatened the record, and when the Indianapolis Colts defeated the Jacksonville Jaguars 35-31, fans were getting nervous. Then, Saturday night the New Orleans Saints fell to the Dallas Cowboys 24-17. Dolphin fans breathed a small sigh of relief. It was only two years ago (2007) when the New England Patriots challenged the record books but when the Pats lost to the New York Giants in the Super Bowl the perfect season was over and the Dolphins continued to have bragging rights. In 1972 the Dolphins secured the only perfect season in NFL history with a 17-0 record (an extremely difficult feat) yet now that the season is expanded, a team would have to go a perfect 19-0 to break this record. Yes, it’s not comparing apples to apples, but you can still say no team has yet to have a winning record including the Super Bowl. Maybe this is the year? 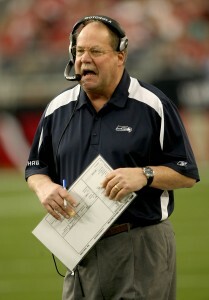 In other big news, former Seattle Seahawks coach, Mike Holmgren, could be taking over the Cleveland Browns. He was reportedly offered 50 million dollars over 10 years. And, finally, the Minnesota Vikings head coach, Brad Childress, tried to bench future hall of fame quarterback, Brett Favre in the game against the Carolina Panthers. The Vikings were ahead 7-6 and Brett (the ultimate competitor) refused to leave the game. 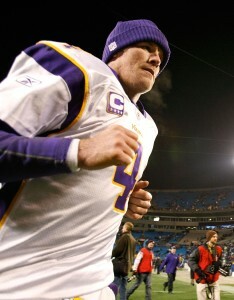 You have to give him props for never giving up, but the Vikings did end up losing 7-26. Elsewhere in the NBA, LeBron did HIS thing against a lowly 76er team. He put up 36 points, 7 assists, and 6 rebounds. Meanwhile, Allen Iverson and the Sixers just can’t get it done. Iverson had 16 points, not a bad game, but this team just isn’t jelling. Andre Iguodala led Philly with 26 points, but they are now 6-19 and falling deeper into the well. Most likely, if they don’t make some major changes, they are headed back to the draft lottery. Cleveland 108, Philadelphia 101. And in the NFL, there has been a serious accident involving Cincinnati Bengal receiver Chris Henry. Henry was in a domestic dispute when he fell out the back of a pick-up truck. Now, it’s reported that his situation is quite serious, and he is fighting for his life. He suffered a major head injury from falling off the vehicle, and is currently on life support. You can only hope that the situation improves. 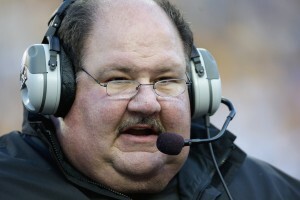 Finally, in the college football world, former Kansas head coach Mark Mangino will receive a $3 million settlement. This is interesting because Mangino was essentially the savior coach at Kansas. The Jayhawk football program was always in the dregs of the Big 12, and Mangino completely turned them around — even leading them to an Orange Bowl appearance (which they won). He received a hefty contract extension until 2012. However, they recently let him go under allegations that he mistreated his players. Mangino denies it, but if you do a YouTube search for Mark Mangino Kansas, you will see cold, hard evidence. Some coaches believe in discipline, but there is a correct way to do it, and Mangino did the opposite. He was essentially the Bobby Knight of college football. The blockbuster baseball trade involving two Cy Young winners is official. Here’s what happened. The Phillies receive Roy Halladay, the best pitcher in the American League, in exchange for strong prospects. In turn, Cliff Lee heads to Seattle to become a second ace along with Felix Hernandez. The reason: Cliff Lee was just a little too expensive for the Phillies to keep, and they had to let him go. This could put the Mariners back in the AL West race again. Elsewhere in baseball trading, the Angels lost their ace John Lackey to the Boston Red Sox. This was one of those predictable things. Lackey pitched incredibly for the Angels last year, and that’s when a team like the Red Sox come looking. The Sox lost to the Angels in last season’s post-season, and they’re hoping that having a strong improvement to their pitching staff will put them atop the Yankees in the AL East again. In college basketball, take a look at the #2 Texas Longhorns. This team is absolutely loaded this year, with some of the best High School recruits in the country. They’re currently 9-0 after absolutely destroying UT-Pan American last night 104-42. That… is a bloodbath. Freshman phenom Avery Bradley led the way with 18 points. This Texas team might seriously go all the way this year. In college football, the undefeated Cincy Bearcats may have lost their head coach to Notre Dame, but they quickly found his replacement. They’re hiring Central Michigan’s Butch Jones to be the new captain. The Bearcats are currently preparing to play Florida in the Sugar Bowl under the guidance of their offensive coordinator, Jeff Quinn. Unfortunately for the Bearcats, their perfect season may have an unfortunate end as all the head coaching changes can leave a team confused and misguided. It’s even possible that their new coach, Butch Jones, could coach them in the game. That’s kind of strange when you think about it. Imagine being led to one of the biggest games of the year under the leadership of one person, and then all of the sudden, someone random is over there on the sidelines calling the shots on the big day. This may not end well for Cincinnati. On Monday Night Football, it was the Arizona Cardinals v. the San Francisco 49ers. With a win, the Cardinals would lock up the NFC West. For the 49ers, a win keeps them in the playoff hunt. Arizona has been confusing this season. They lose to an average team, then turn around and beat the Vikings. Very strange. So… how would they fare against a hungry 49er team? The game started off all San Francisco. In the first half alone, quarterback Alex Smith hit both Vernon Davis and rookie Michael Crabtree for touchdowns. It was 17-0 San Fran at the end of the first half. The Cardinals would get a little production in the second half due to some solid running from rookie Beanie Wells, but this game simply belonged to the 49ers. 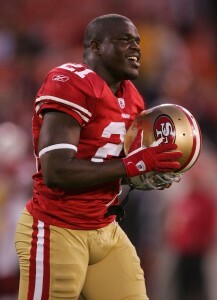 Running back Frank Gore blew up with 167 yards and touchdown. This win keeps them in the wild card picture, but they will most likely have to win the rest of their games and hope for some lucky losses elsewhere. San Francisco 24, Arizona 9. In baseball, the off-season trades/free agent acquisitions are starting to heat up. Reportedly, a deal is close that would send Toronto Blue Jays ace Roy Halladay to the Philadelphia Phillies, and also current Philly Cliff Lee to the Seattle Mariners. Obtaining Cliff Lee would put the Mariners back on the map, as he would pair with their other ace pitcher Felix Hernandez. For the Phillies, obtaining Halladay would put them right back in World Series contention yet again. However, they would have to give up their top two young prospects to Toronto. Sure, Toronto might be losing their ace, but it was time that they finally traded him as a chip for young talent. And in the NBA, the Allen Iverson experiment hasn’t worked out so well. They continue to lose, and haven’t even come close to selling out arenas. However, last night, he finally helped them end their 12 game losing streak against the Golden State Warriors. Thadeus Young was the hero for the Sixers with 26 points and 14 rebounds, but Iverson’s 20 points helped lift the Sixers over the Warriors. Philadelphia 117, Golden State 101.